Good teachers always have excellent classroom management. Things can get crazy really fast if important procedures, routines and expectations aren't put in place from the very beginning. Here are some fun coloring pages that can help you and your classroom in this regard. Enjoy! Visit my School Environment page for more school wide management techniques and positive routines and practices. 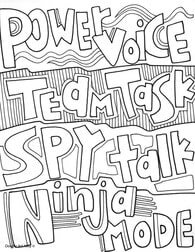 Fun Coloring Pages that describe expectations and rules for the classroom. They promote kindness and compassions along with a safe environment for students and teacher. Learning can't take place without these things in place. Share with your fellow teachers! These are great pages that will help get your classroom procedures in place at the beginning of the year. There are attention grabbers, noise level reminders and lining up routines among others. Check it out and see if there is something for your classroom! Enjoy!